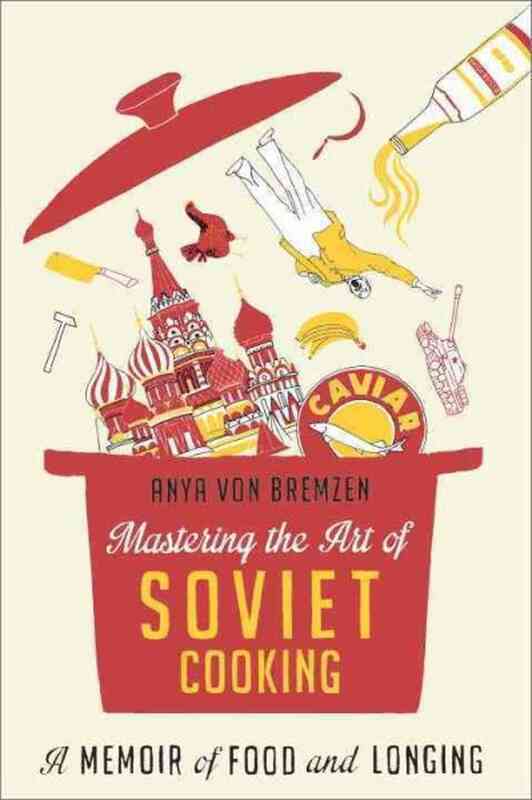 It’s an easy, obvious joke to make, and probably the most common reaction to Anya von Bremzen’s new memoir, an exploration of twentieth-century food history in the Soviet Union. After all, the USSR, like Mao’s China, is popularly known as a land of famine, the home of breadlines and cabbage soup—a far cry from the extravagant French cuisine celebrated in Julia Child’s landmark Mastering the Art of French Cooking, the inspiration for the book’s title. But when von Bremzen, who was born in Moscow in 1963, arrived in Philadelphia with her mother in 1974, she reeled in horror at “alien Wonder Bread” and “the Day-Glo that is Velveeta” and longed for the familiar tastes of the homeland she had left behind. Shuffling the aisles, I felt entombed in the abundance of food, now drained of its social power and magic. Who really wanted the eleven-cent bag of bananas if you couldn’t parade it down Kalinin Prospect inside your transparent avoska [carrier bag] after standing in a four-hour line, basking in envious stares? What happened when you replaced the heroic Soviet verb dostat’ (to obtain with difficulty) with the banal kupit’ (to buy), a term barely used back in the USSR? Shopping at Pathmark was acquisitioning robbed of thrills, drama, ritual. But von Bremzen, an award-winning cookbook author and food writer, tells a story that goes beyond a recitation of her memories of childhood meals. Instead, she and her mother join together to explore Soviet cuisine across the decades, cooking their way through the history of the USSR. They begin with an elaborate late-Romanov feast, a time-intensive and indulgent array of dishes that would be swept aside after the revolution in 1917 in favor of straightforward, “proletarian” food that was to be consumed as fuel for labor, not enjoyed. Food, the new Soviet leadership learned, was a useful “tool of political and social control”: by bestowing or withholding the state’s bounty, the government could signify its approval or condemnation of an individual’s actions. It also became a perk of political reliability: the nomenklatura, or favored officials, enjoyed access to treats unimaginable on the tables of regular citizens. “Tastes like your usual watery shchi,” her brother, Sashka, would mutter. Mom disagreed. Just renaming a dish, she discovered, had a power to transfigure the flavor. When emigration became a possibility in the early 1970s, Larisa finally decided that the time had come to leave the USSR due to a combination of two factors: Anya’s supposedly fatal case of scleroderma (which, they learned in the U.S., was nothing more than a common childhood affliction misdiagnosed by Soviet doctors), and the increasing impossibility of filling their dinner plates. In Philadelphia, Anya longed for what she had left behind, while Larisa happily prowled the Pathmark aisles, filling their cart with Pop-Tarts and Oscar Meyer bologna. Mastering the Art of Soviet Cooking successfully turned on its head my previous assumption about daily life under communist rule. I particularly liked von Bremzen’s introductory description of the story she sought to tell: “Of food as the focal point of our everyday lives, and—despite all the deprivations and shortages—of compulsive hospitality and poignant, improbable feasts.” She reminded me of something often too easily forgotten: that in the midst of a national tragedy, there can still be moments of happiness, even joy. The emergence of Cultural Revolution-themed restaurants in today’s China often raises the question of why people feel nostalgic for the Mao era. Part of the answer, I think, is that we look at Mao’s time, or Stalin’s time, and only see the big picture—gulags; people losing their jobs, and sometimes their lives, for minor political violations; collective madness. We lose sight of the personal level: the day-to-day banality of life, in which the most memorable moment might not be reading the Party’s latest screed in Pravda, but savoring the first bite of a Red October chocolate bar. Edited to add: After finishing this review and scheduling it to run, I came across this Foreign Policy article that von Bremzen has just published, which nicely summarizes some of her main points—and includes some of the delicious details that I couldn’t fit into this post.